Was at the Santa Monica classic car show today with the SliceTruck and figured those who weren't there should know who won it. 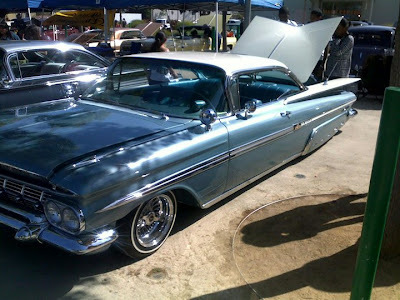 This is it right here, 1959 Chevrolet Impala. You see? Very good. You should have come it was decent. Also....Old school L.A. gangs are more intimidating in person than in my imagination. Have you ever seen the movie Blood in Blood out? Its a good one, put it in the queue. Point being that if you came by today you could have possibly seen some old school serious L.A. gangs just hanging around.